Women who carry excess weight on the hips and thighs, and apple-shaped men who carry it on the waist, risk dangerous blood clots, say experts. 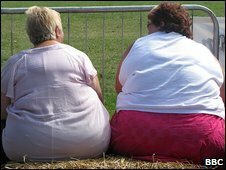 Being overweight per se is risky, but where the fat accumulates is also critical, say the Danish scientists. They tracked more than 50,000 men and women to see how many suffered a deep vein thrombosis (DVT) or a clot in the lung called pulmonary embolism (PE). The findings are published in the journal Circulation. During the 10-year study, there were 641 cases of DVT or PE among the men and women. After stripping out known risk factors such as smoking, diabetes and cholesterol, a pattern between body shape and clot risk emerged, independent of body weight alone. Pear-shaped women with big hips and thighs were at higher risk of dangerous clots, even if they had an "ideal" body weight. For men, an expanded waistline was riskier. Lead researcher Dr Marianne Tang Severinsen, of Aarhus University Hospital in Aalborg, said: "Until now, the importance of fat distribution and venous thromboembolism risk has not been evaluated. "The implications to the public are that all types of obesity increase the risk for venous thromboembolism, but the location of body fat also plays some unknown role. "For health professionals, the implication is that all types of fat distribution should be taken into account when evaluating risk of venous thromboembolism." It is unclear exactly how the fat increases the clot risk, but experts believe it could be partly physical - compression on the veins - and partly chemical - fat cells make hormones that encourage clotting. Judy O'Sullivan, cardiac nurse at the British Heart Foundation, said: "Excess body fat poses several threats to your health, particularly when it is stored around your waist, so it is best to try and avoid it by exercising regularly and eating a balanced diet low in saturated fat."